Guides or WRVS during the World War II? 4th from the right is Emily Hill (married name Ross) who lived on Seabank Road. 7th from the left is Matta Bremner and sixth from the right is Mrs. Ogilvie. 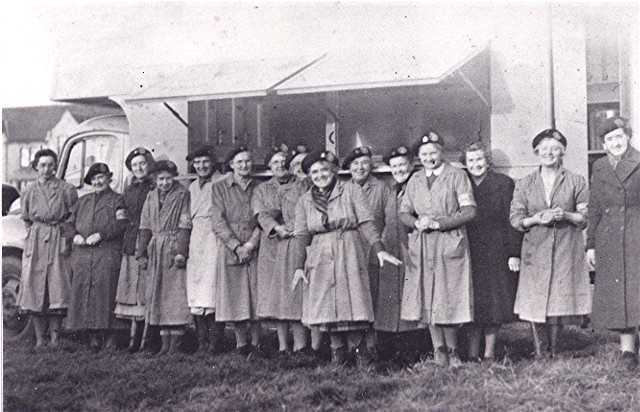 I'm not sure that the sixth from the right is Mrs Ogilvie - was it one of the Evans sisters? My guess is that 2nd from the Left is Jess Ross who was head teacher of Saltburn School and next to her Alice Wilson (nee Macleod), teacher of our Primary 6 class. 5th from the Left is Mrs. Graham but I do not remember anymore about her. Sorry Freda, but I would have said that Alice Wilson is 4th from the right, she always stood like that especially before she was going to belt someone at the school, the calm before the storm. She used to call it her listening pose. When we were visiting with Mam she told her that pose covered all eventualities! !